William Wordsworth (1770–1850) was England’s Poet Laureate from 1843 until his death. He and his friend Samuel Taylor Coleridge helped launch the Romantic Age in English literature with their 1798 joint publication of Lyrical Ballads. 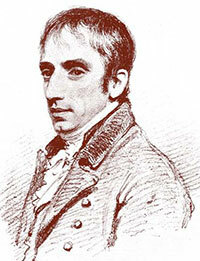 Wordsworth’s masterpiece is generally considered to be The Prelude, an autobiographical poem of his early years that was never published during his lifetime. The core of the William Wordsworth collection at BYU was donated by Edward M. Rowe, a former professor of English Literature at BYU and the collection's namesake. The Rowe Collection of William Wordsworth houses a rich gathering of primary and secondary works relating to the life and career of William Wordsworth and his sister, Dorothy. This includes numerous editions of William’s poems, prose works, and correspondence, dating from the 1790’s to the present day, editions of Dorothy Wordsworth’s writings, and secondary works, including biographies and criticism. The Rowe Collection also includes a wide variety of items which illustrate Wordsworth’s literary and cultural impact over the past two centuries. This includes works representative of the popularization of the English Lake District, where Wordsworth made his home.